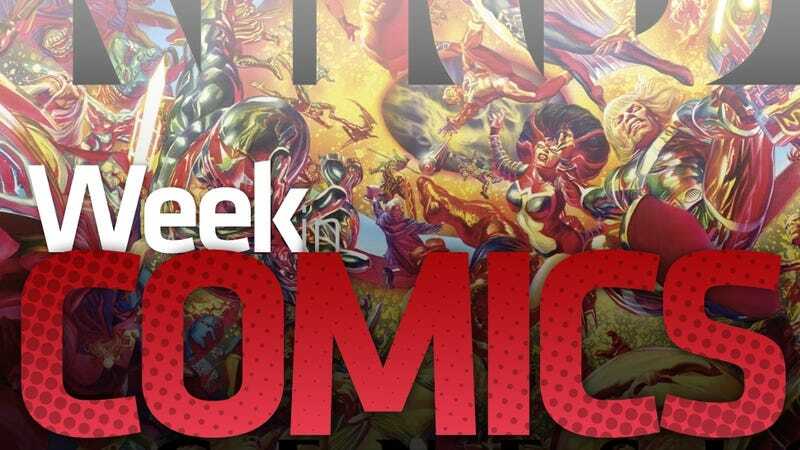 New comics arrive in comics shops every Wednesday. New and old ones hit online comics apps on Wednesdays, too. After a week's break from E3, I'm back to recommend a few, though, I'm sorry to say that this week is light on promising new books. Here are my recommendations as well as the normal run-down of video game comics. Happy, comics reading! DC Universe Online #10 Official summary: "! Lex Luthor has saved the day and done what Superman couldn't by rescuing the Daily Planet and foiling Brainiac's plans. Now, Superman must answer to the JLA for his dereliction of duty, and it won't be pretty!" Deus Ex #5 Official summary: "Adam Jensen closes in on his former ally Durant...but who's pulling the psycho cyborg's strings? Is this all a feint to undermine Sarif Industries? If so, who's behind it?" Gears of War #17 Official summary: "Best-selling author Karen Traviss continues to explore the years prior to 'Emergence Day.' It's the end of boot camp and the start of the real war for new recruits Marcus Fenix and Carlos Santiago. Marcus immediately establishes his reputation as a hard-charging Gear and natural leader, while his father struggles for a breakthrough in his orbital laser research, codenamed Hammer of Dawn." Level Up (graphic novel) Official summary: "Dennis Ouyang's parents want him to become a doctor. But Dennis just wants to play video games. What happens when fate takes a hand - in the form of four adorable, bossy, and occasionally terrifying angels—to lead Dennis down the straight and narrow path to gastroenterology?" Sonic Universe #29 Official summary: "Inside Job' Part 1. Step aside Sonic; this arc stars Scourge! The vicious 'Evil Sonic' is under heavy lock-down in Zone Jail. Can it be that the would-be world conqueror has been beaten into submission? And when some unlikely allies arrive, will his ego allow him to accept their help?" The ComiXology Comics app has a batch of new comics, as always, including most (but, oddly, not all) of Paul Cornell's recent Action Comics. That run featured Lex Luthor on a quest for power that had him crossing paths with many classic comics villains as well as, shock of shocks, Death from Neil Gaiman's Sandman. Also at ComiXology... Grant Morrison and Jae Lee's four-issue Fantastic Four: 1234 debuts on the store. I haven't read it in a while, but I recall it being smart and a bit melancholy. One of Morrison's overlooked works. Recommended. If you have Green Lantern fever, the first 21 issues of the 1960s comic series that debuted Green Lantern Hal Jordan are also now in the shop, though, in brightest day, beware the price of these old comics … for $2 an issue? They've been reprinted for cheaper. The full 12-issue run of Mark Gruenwald's 1980s Marvel series Squadron Supreme is also on the shop. I have heard good things about that, but also heard this team was simply Marvel's take on the Justice League. Worth reading? You tell me. Captain Britain and MI: 13 #1-8 I bought this series on my iPad a while ago, after hearing great things. I knew nothing of Captain Britain (his earlier 80s comics is one of my few Alan Moore blindspots) and had never ready any of the Secret Invasion storyline that the first four issues of this recently-cancelled short-lived series cross over into. Nevertheless, this series has been a fantastic read. Captain Britain is Britain's top costumed icon. He leads a team of super-heroes on behalf of the British government to battle supernatural threats. Arthurian threats. Evil spirit. That sort of thing. On the Captain's team, at various moments in the serues, is a shape-shifting alien who takes the form of John Lennon, a nurse who can rip bodies apart, a man who may or may not possess a sword that is trying to turn him evil, a super-heroine who is sort of secretly a vampire and Blade, the Wesley-Snipes-famous vampire-hunter who, as soon as he joins the team, stabs the vampire-lady with a wooden stake. Clever, surprising and entirely comprehensible even if you know little of Marvel's lore. The series is delightful (and only 15 issues long).